At age 35 and newly single, author Sarah Elizabeth Richards wondered if egg freezing was her ace in the hole, her guarantee of a future baby. 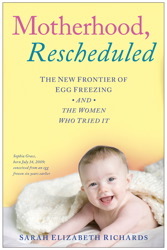 Here’s her story, from Motherhood, Rescheduled: The New Frontier of Egg Freezing and the Women Who Tried It. It was only after I turned thirty-five—the point of no return—that I began to seriously consider what egg freezing could do for me. I fantasized about what it would be like to be free from the suffocating press of time that constantly reminded me that my entire future happiness depended on the decisions I made over the next few years. It meant I could escape the penalties for lacking the spine to leave a relationship I knew was not working. It meant redemption. Egg freezing seemed too good to be true, in the same baffling way a diet pill promises to magically wipe out the caloric damage of waffle fries or Botox can make you look forever twenty-five. It felt unnatural and sort of unfair, as if I could buy the privilege to take the final exam later than the rest of the class or skip filing taxes. I wondered if I would approach dating differently if I was no longer in such a rush. Maybe I’d treasure these next few “free” years unencumbered by baby anxiety and write a bunch of books, train for a marathon, and solidify a marriage. That way, I’d be in an even better position to be a mom. Would egg freezing clarify my life? Complicate it? Or leave me right where I started? My girlfriends and I loved to linger over dinner and imagine what life would be like off the clock. We speculated that some of our married friends may have been more selective and would now enjoy better marriages if they hadn’t feared being “put out to pasture.” We lamented peers who had panicked prematurely and gotten stuck with reluctant fathers or left home alone as single moms. We wondered whether gun-shy friends would make more of an effort to date if they thought their ovarian age no longer mattered. We mused about what it would be like to have the same reproductive freedom as men, even to date and think like men. Or (gasp!) actually date younger men—a biologically attractive pairing, considering women live on average six years longer than men. Men would also have more choice of partners, since those who wanted children wouldn’t have to seek out for their egg quality women who would never understand why they spent nights and weekends playing Dungeons & Dragons in high school. In any case, surely men would appreciate a little less pressure from us. They also might be more willing to give relationships a serious try if they didn’t fear they were wasting our last chance at motherhood. However, the idea of stopping the clock also made us a little uneasy. You could never actually count on egg freezing, and any relief was overshadowed by the awareness that your remaining fertile years were still ticking away. So far, the success rates of egg freezing ranged wildly and were always accompanied by asterisks explaining that the technology was rapidly improving and that you could game the odds by freezing several rounds of eggs. Still, it was a bewildering equation. How were you supposed to be cautious and hopeful at the same time? Even if egg freezing did work, the question remained: Would tinkering with such a finely tuned reproducing machine lead to harmful social and personal consequences? You would be an older mother and might endure a more difficult pregnancy. You might not see your children marry or know your grandchildren. Your own parents might not even meet their grandchildren. As my wise friend Janelle said, “Maybe you’d just drag out the whole thing. At forty-five, you’d still worry if you were ready to be a mom. Without the clock, there’s no trigger to force you into action.” She had a point. Deadlines serve a purpose in life. How would you live your life if you could stop your biological clock? If you could be free of the "baby panic" that has tormented an entire generation of women who postponed motherhood to pursue careers or find the right mate? Would you date better? Marry later? Relax more? In Motherhood, Rescheduled, journalist Sarah Elizabeth Richards tells the stories of four women—including herself—who attempt to turn back time by freezing their eggs and chart a new course through their thirties and forties. She also explores the hard facts of egg freezing—from the cost and practical obstacles to the probabilities of success. Above all, she shares the stories of these women, and especially her own, with emotional honesty and compassion, and makes the journey for all ultimately redeeming. Sarah Elizabeth Richards is an award-winning journalist specializing in health and science, psychology, and social issues and has written for more than two dozen newspapers, magazines, and websites, including The Wall Street Journal, The New York Times, The Washington Post, the Financial Times, Elle, Marie Claire, Slate, and Salon. She lives in Manhattan. Share Wouldn’t It Be Nice to Ignore a Ticking Biological Clock?